The BT-ED70S-A uses ED (extra low dispersion) optics to reduce the effects of chromatic aberration. As a result, this lightweight astronomy binocular delivers superb images of the moon and planets and is also perfect for viewing double stars and other colour critical objects. 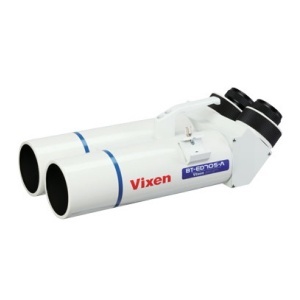 Designed for use with Vixen's NLV range of eyepieces, this binocular is very portable at just 4kg and can be used with either Vixen's HF2 fork mount or a conventional video panhead. As with the other models in the range, the ED70S is also well-suited to long distance terrestrial observation. It's stylish and clean design makes it a great choice for riverside, coastal or rural properties with balcony views.